After over 14 heroin deaths occurred in one week in Hamilton County, Ohio, four Pastors were compelled to bring the Gospel to the streets and launched what would later be known as Hope Over Heroin’s first outreach in the summer of 2014. Prayer warriors were mobilized, community compassion evangelism began, and the church was brought to where addicts and families most impacted from the Heroin/Opiate Epidemic lived. Explosive growth has occurred since that time with thousands of lives transformed. 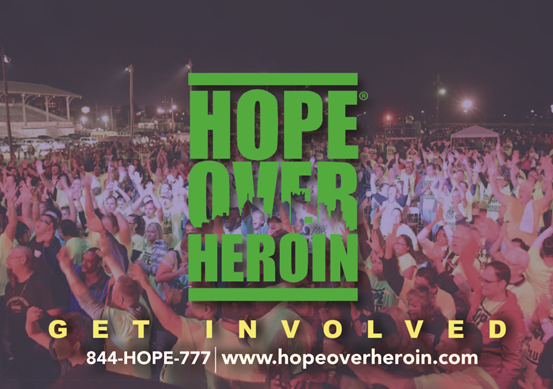 Hope Over Heroin is a collaborative faith-based ministry believing in and witnessing the power of the Gospel of Jesus Christ to change lives. While we are a faith-based organization, we recognize the importance of every resource that makes up a community’s fight against addiction. There is no singular solution. Our greatest strength is and continues to be uniting dozens of addiction and grief recovery resources at one location providing instant accessibility for those in urgent need in each community visited.